The Freeport of Riga in Latvia finished the first quarter of 2017 with a positive balance — cargo volume increased by 2.1% compared to the last year. The month of March was also successful; the handled cargo volume was 7.9% more than in March 2016. The increase is mainly attributed to the positive performance of coal, container and timber segments. 3.5mt (million tonnes) of coal were transshipped via Riga port, which is 18.4% more than during the same period last year. According to the Freeport of Riga Authority’s market analysis data Russia’s coal export flow through the Baltic Sea ports has significantly increased compared to the first quarter of 2016. Thus, the coal cargo volume has increased at both Russia’s own ports and coal terminals of Riga port and at Ventspils port. Dry bulk segment demonstrated the positive quarterly figures also in grain, wood chips, sawn timber and metal cargo groups. The total volume of metal group bulk cargo — ore, scrap metal and ferroalloys — has increased by 32.8% compared to 2016. Thanks to a significant increase in lumber and woodchip cargo groups, the timber volume transshipped by the port has reached 1mt and increased by 3.3% compared to the last year. In the first quarter of the current year there have been very positive developments in general cargo segment, where the last year’s cargo turnover index has been exceeded by 15.4%. The volume of containers, handled at the port, continues to grow. In the first three months of 2017, 110.4 thousand TEU of containers were transshipped through the port of Riga, which is the first quarter’s highest figure over the Port of Riga history. Ro/ro cargo turnover of general cargo segment has also increased by 33.9%. This increase is largely attributed to the Tallink ferry line more intense activities during this year. The Freeport of Riga is the largest port in Latvia. In 2016 cargo turnover volume amounted to 37mt. 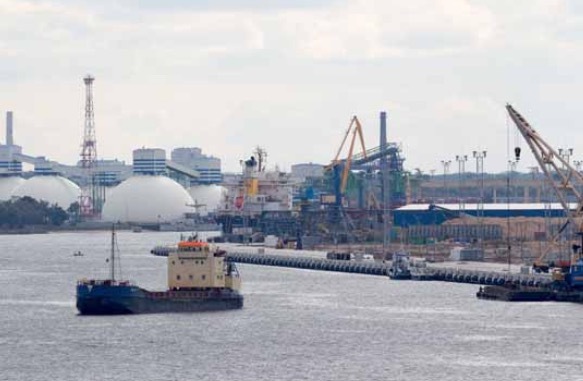 The Freeport of Riga is a multi-functional port with a modern and secure infrastructure, where high quality services are provided by 194 private enterprises operating at the port, including 35 stevedoring companies (cargo handling terminals). The Freeport of Riga Authority (FPRA) manages the port, and is responsible for the maintenance of the port infrastructure, for the port security, as well as for the port land and infrastructure leasing to private enterprises.The FPRA is the executive body that implements the Freeport of Riga Board decisions on port development. The FPRA is not engaged in commercial activities at the port. Its revenues consist of port dues, collected from the vessels, as well as of land and berth rent fees. The FPRA operates in compliance with the principles of non-profit organizations — its financial resources are spent only for the port management and development.